It is hot here is Southern California. Like 90+ degrees Fahrenheit hot. Which makes going to school uncomfortable and spending time outside afterward just plain torture. 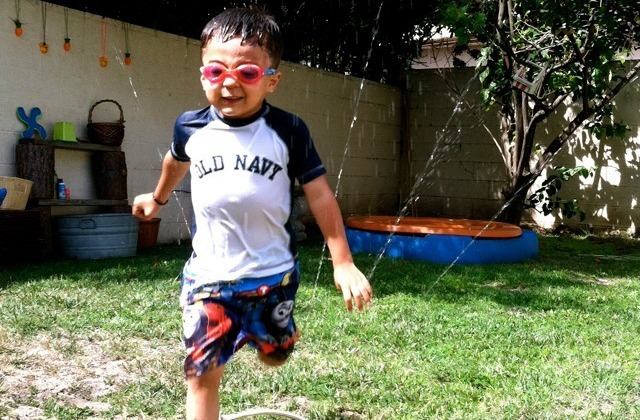 Running through the sprinklers is one of our favorite ways to play with water in the backyard. We don’t even both to turn on our sprinklers; we simply add a sprinkler attachment to the end of a hose to get the water going in all sorts of directions. You don’t need to leave the water running long to pack in lots of fun. Bored with that idea? Vary things up a bit by hooking up the hose to a slip and slide. Or fill up a kiddie pool and go for a dip. 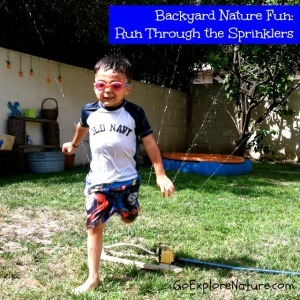 Looking for more ways to get the kids outside and into nature before summer’s end? Check out 50 ideas for your summer outdoor bucket list. We&#39;ve been running through sprinklers at friends&#39; houses, but let our own grass die this year. Water is getting so pricey that I am saving it for the garden. Luckily, we have a river near by! The Little Explorer&#39;s face is priceless!